How do scientists power the International Space Station and other spacecraft with electricity? Read on to learn more about electrical power for space exploration. How do scientists power all the spacecraft and satellites in space? They certainly cannot use an extension cord, so they must have ways to generate power for all the electrical systems. Here on earth, we can use batteries to control everything from cell phones to hand tools. However, the batteries will need to hook up to an electrical source to recharge. If spacecraft use batteries, what recharges those batteries? Solar panels operate by using photons from the sun to release electrons from atoms. From here on, the electrons collected provide electricity for the spacecraft to operate. A spacecraft as large as the International Space Station needs large solar panels. In fact, large numbers of cells assembled in arrays produce high power levels. This method of harnessing solar power is called photovoltaics. Each ISS solar array wing consists of two retractable “blankets” of solar cells with a mast between them. Each arm uses nearly 33,000 solar cells and when fully extended is 35 meters (115 ft) in length and 12 meters (39 ft) wide. The ISS has eight solar arrays. Altogether, the arrays can generate 84 to 120 kilowatts. How do the batteries on the ISS charge? During its orbit around the earth, the solar arrays capture sunlight which then recharges the batteries. Consequently, the batteries only have a 6.5-year lifespan and must be changed out frequently. When spacecraft orbit near the sun, the ability to recharge the solar panels remains fairly consistent. What about spacecraft like NASA’s Voyager 1 and Voyager 2? Launched in 1977 these amazing explorers have logged 13.3 billion miles from the Earth. Furthermore, they travel at nearly 32,000 mph. Voyager 1 is in “Interstellar space,” and Voyager 2 is currently in the “Heliosheath” — the outermost layer of the heliosphere. At this place, the solar wind is slowed by the pressure of interstellar gas. Both spacecraft have Plutonium 238 powering them. It slowly decays releasing alpha particles that heat up the inside container. As a result, the heat energy transfers into electricity. In 1977, each Voyager had 470 watts of electrical power. Now that they have traveled for over 40 years, scientists believe they only have another ten years left of electricity. Once the electricity runs out, the spacecraft will no longer be able to communicate with NASA. 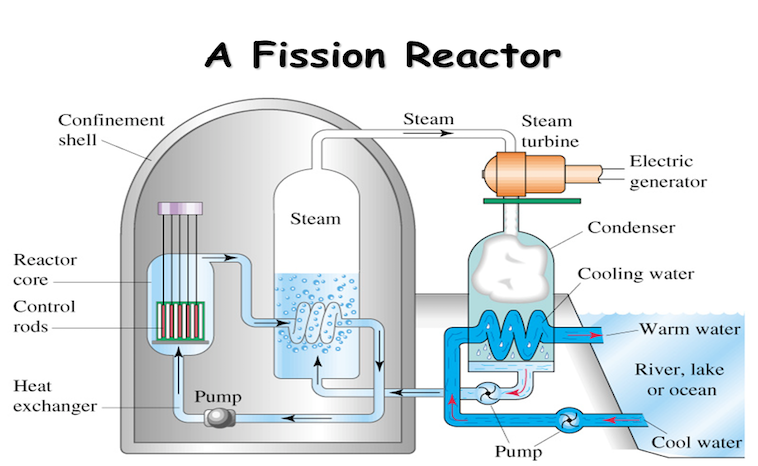 Nuclear Fission reactors also power spacecraft. They operate almost the same as the ones here on Earth. They use Uranium 235 as a fuel for a fission reaction. The nucleus splits thus releasing energy. A kilogram of Uranium can provide the same energy as three million kilograms of burning coal. The Soviet Union manufactured several satellites that use nuclear fission reactors. The nuclear reaction inside of these spacecraft can generate 3000 watts of energy. In addition, two of the satellites can produce 5000 watts of electricity. Although this type of reactor generates a significant amount of electricity, governments banned its use for several years. The international community had a concern about returning satellites crashing into Earth. One Soviet satellite did crash into northern Canada several years ago and only one percent of the radioactive debris was recovered. A couple of years back, the international community lifted the ban on nuclear fission reactors for space. As a result, scientists have resumed their research using this type of electrical power. We look forward to ongoing developments in this technology. Mars… The King of Dust Devils! Are You Ready to View the Geminids Meteor Shower? It’s the Longest-Lasting Stellar Eclipse Ever!